The theme this month is Tropical March. I immediately went to pineapple and coconut as most of you would but wanted something different. Then I started thinking of cocktails and started to conjure up images of little umbrellas coming out of the drinks that I have seen poolside. 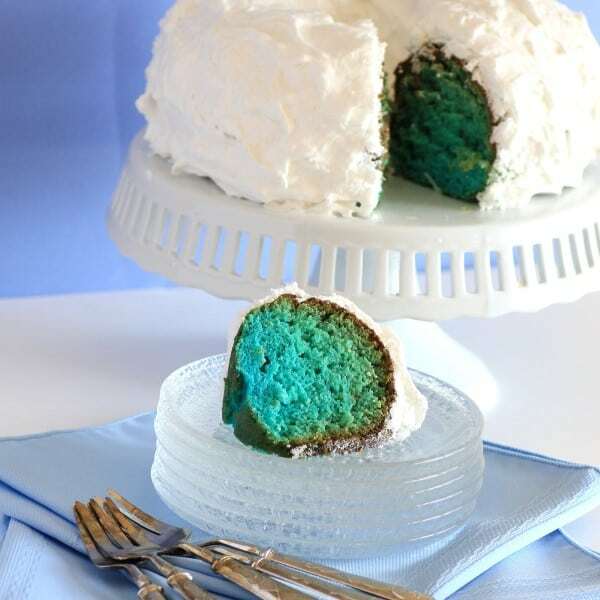 Hmmm, there are pina coladas that I love and daquiris of all flavors but then it came to me A BLUE HAWAIIAN BUNDT CAKE!!! Sure why not! That is crazy enough to work I thought. Get all the flavors of a Blue Hawaiian cocktail in a cake and then top it with a big layer of fluffy coconut seven minute frosting. I had visions of Elvis in his white pantsuit holding a piece of my cake. WOW, my mind went nuts with this!! Anyway, so much fun, that’s what creating is all about. This cake turned out to be fabulous. I had never baked a blue cake before so I was anxious to frost and finally cut into it. It was so moist and flavorful, I got rave reviews!! Enjoy!!! A wonderfully moist cake that tastes like a Blue Hawaiian cocktail. Preheat oven to 350F. Grease and flour a bundt pan. In a large bowl of a standup mixer with a paddle attachment blend butter and sugar together for 2 min. on medium speed until light and fluffy. Add eggs and coconut extract and blend. Mix flour with the salt and baking powder and add to the mixture along with the sour cream. Beat for 2 min. scraping down the bowl often. Stir in Blue Curacoa, rum and pineapple juice. Add blue food coloring to desired color. Pour the cake batter into the prepared bundt pan. Bake for 45-50min. or until cake tester comes out clean. Cool completley in pan. Invert onto serving platter. For the frosting add the sugar, cream of tartar, salt, water, and egg whites in the top of a double boiler or metal bowl. Beat with a handheld electric mixer for 1 minute. Place pan over boiling water, being sure that boiling water does not touch the bottom of the top pan. Beat constantly on high speed with electric mixer for 7 minutes. Beat in coconut extract. Fold in coconut and ice cake. Here is the amazing line up for this #BundtaMonth, check them all out!! LOL! Love your Blue Hawaiian, Tara. What a fantastic and delicious idea. My husband’s favorite color is blue (and Elvis officiated our Las Vegas wedding) so this would be a perfect anniversary cake. Thank you! This would be a perfect anniversary cake for you!! Thanks so much for coming over!! I love Blue Curacao! Fun cake! 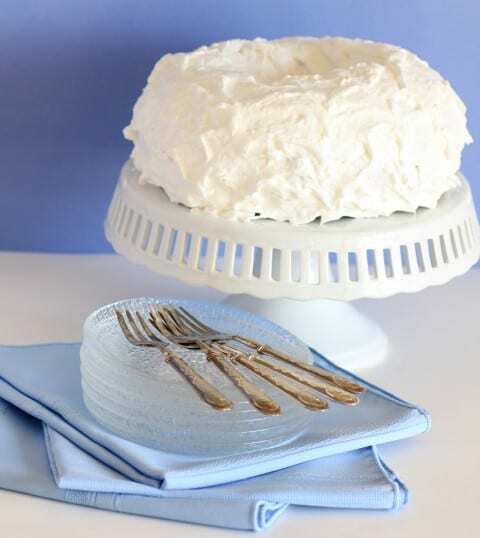 Wow, this is one beautiful blue cake. I love all of the flavors, especially that coconut frosting. Thanks Carrie, didn’t know how it would look inside but I think it turned out pretty good. I know the flavor was amazing!! oh wow! what fun! and LOVE the bundt! You had visions of Elvis in his white pantsuit holding a piece of your cake?! How awesome is that?! This was a fun cake to make!! LOL on Elvis!! That ombre inside is amazing! I´ve never had blue curacao, but with such a color it makes baking so much more fun Tara! Thanks so much Paula, that was fun to make!! Tara, this is so much fun! I love that you decided to go big and make your cake blue. It looks amazing – I can tell from the cut slice how incredibly moist it is inside. And the flavours – yum! Elvis would be extremely happy with this cake, as would I. Thanks so much, it was very moist and so full of flavor, thanks for coming over!! Oh what a fun cake Tara! I love seeing how people turn cocktails into cakes. What inspiration you had for this one. It was a lot of fun Renee, I enjoyed doing this one very much!! Oh my gosh, you’re such a great baker!!! I am not a great baker but an experimenter. I was happy it turned out!! I’ve made Blue Hawaiian cupcakes before and they are amazing. I love the flavors in this cake and I think it’s really neat that it looks all white until you cut into it. What a fun surprise! This is definitely a cake just waiting for a party!! What fun and I love all the thought that went into it. Sounds like it tasted great too! Thanks so much Holly, my neighbor absolutely loved it!! It was a good tasting cake!! Whoa!! Look at that!! That is absolutely gorgeous. What an incredibly creative idea and I bet the flavor was incredible. Love that you were really thinking outside the box this month and came up with such an amazing cake. Thanks it was fun!! Elvis and I created that one!! Super cool cake, Tara. You really had us all wondering w/your teaser…gorgeous color! I never had this drink but now I’d much rather have a slice of this beauty:)Thank you being a part of #BundtaMonth! Thanks so much Lora, it was a fun cake to make!! What a wonderful recipe and I am so loving the blue on the inside! This cake couldn’t be any more perfect!! I usually avoid blue drinks but I have to admit that is one beautiful Bundt! I also love the fluffy white frosting! Thanks for coming over Stacy and thank you so much!! This is absolutely wild! Love it! And love the photo at the top, you did a great job with the plates, napkin, etc. It is wild, I admit, brain went on over drive for that one!! Thanks for coming over Laura!! WOW! My gosh, Tara, I LOVE that color! What a beautiful cake! Sure is, just like a Blue Hawaiian!!! Feel free to link up to 3 posts! This looks sinfully delicious!! I am so happy to tell you that it is featured in this weeks Manic Monday! Come on by and share a few more posts today and don’t forget to pick up your “featured” button!! Wow, thanks for much for the feature!! This sounds so good. Can you use coconut rum. Yes, for sure, I would back off on some or all of the coconut extract then. Love that up close and personal shot of the blue cake!